Fabricated from C1045 steel, then heat treated to a minimum of 50 RC hardness. 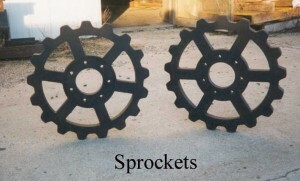 Outlasts cast sprockets by as much as 5 times. Easier to install than one piece. Only replace the portion that wears out, saving you money. Fabricated construction to bolt your segmental sprockets and traction wheels to. Split design allows exceptional ease in installation. 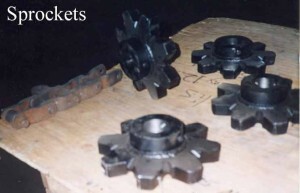 You do not have to remove the shaft to install, reducing your down-time significantly.